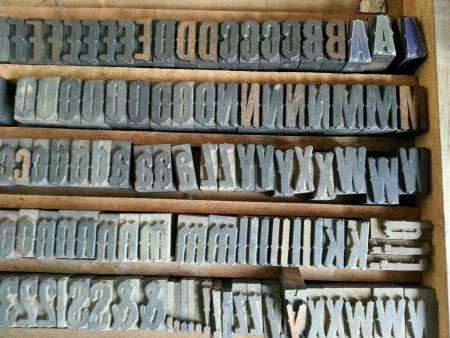 Later topic: What typeface is this? 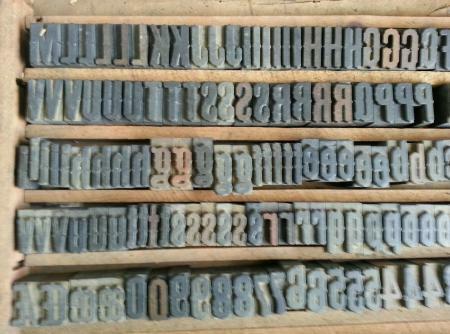 I looked in several of the on-line Wood Type books, but I couldn’t identify this font. The capital A’s were replaced with Zinc Plates on wood, so no maker’s mark. Does anyone have any history on this font? This one is 6 line. 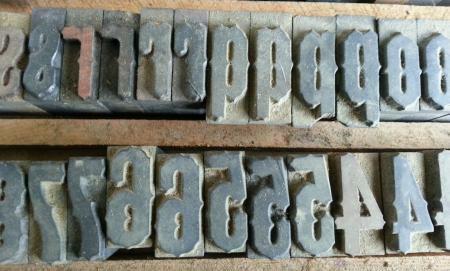 Maybe a variation of Gothic Tuscan? I have a well-worn 6-line font of this in uppercase and figures only. I have it listed as Tuscan Gothic Pointed from Vandenburgh & Wells, c.1877. There is nothing stamped on the As however. I have cataloged and found the names of my fonts over the decades, but unfortunately did not record, the source of my identifications. I’ve had this one for ages and do not recall exactly where I obtained it. I can’t see the complete font, but the fact that there are three figure—5’s, makes me think that Cooley cut it, since that is one of the clues to his fonts, although there are several wrong-fonts showing. If the font has any diphthong ligatures, that would be another clue. 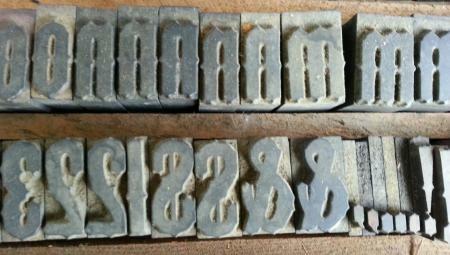 Here is a showing of the font that is in the Lyons Collection, now at MassArt. Cooley’s name for the face was Gothic Tuscan Condensed No. 5. Thanks for the ID, folks! That helps a lot. Here are a couple more photos, though a bit blurry.